Summary: In 2014, the author published her memoir, DAYS OF DAZE: MY JOURNEY THROUGH THE WORLD OF TRAUMATIC BRAIN INJURY. 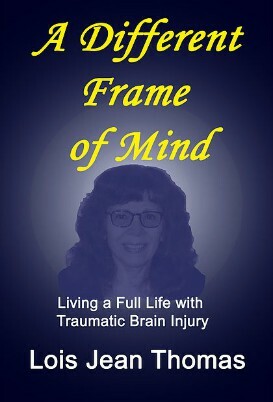 In this follow-up book, she describes her efforts to cope with her lingering brain injury challenges, exploring the long-term physical, cognitive, emotional, and spiritual impact on her life. I have not read Lois’s original memoir but I found this follow-up book to be a full book by itself. You do not need to read one to read the other. Lois shares how her daily life is different now from her old life but also how she has learned to cope with the problems left over by her brain injury. I really was no prepared for how much her brain injyry affected her life. I know of one person who has a TBI (Traumatic Brain Injury) but her life isn’t affected as much and I didn’t realize it affected everyone differently. Now I don’t have a TBI but I do suffer from invisible illnesses (Bipolar, Fibromyalgia, Migraines, Recurrent Pericarditis) and pushing myself when I shouldn’t always results in bad outcomes. But it can be hard, especially with regards to the mental illness because those who don’t get it think we just need to try harder to be happy or productive. So we tell ourselves the same things and then feel bad when we still have an illness. We have to realize our limits and work with them, not against them. Once you read the book and see her daily struggles you will find it amazing that she has produced not only this book but other books as well. She that thought it may be hard it is possible to live a full life with a TBI, just like her tagline says.